I’m back with another Five Minute Friday card today! I’ve missed being able to share these. Making cards doesn’t have to be complicated. Believe me, whomever you’ve giving this to will appreciate that you took time to make something for them. 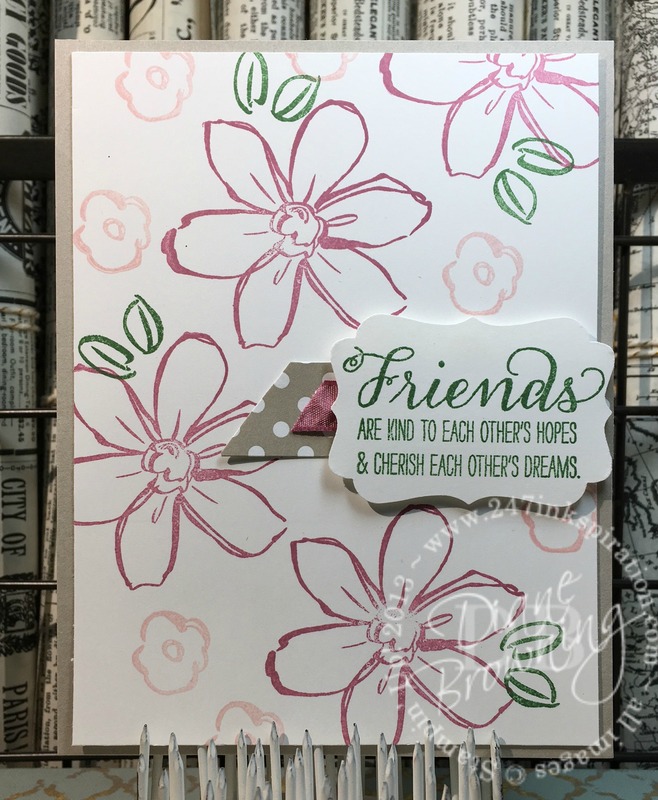 Today’s card uses the Garden In Bloom stamp set. The stamping on this card is quick. I started with the large flower in Sweet Sugarplum. Then I added the leaves in Garden Green. The little flower was last in Bashful Bride, filling in the remaining space. The sentiment was stamped and punched. Below the sentiment is a strip of the Brights Designer Paper Stack and a bit of the Sweet Sugarplum Ruched Ribbon. I mentioned on Wednesday that the Retirement List has been released. The Garden in Bloom stamp set is not retiring at this time. But both the Decorative Label punch and the Brights Designer Paper Stack are retiring. I am going to miss these paper stacks. You get so much paper that you’ll have plenty to last you a while. The Paper Stack and the punch are both items that are only while supplies last and I expect these to go fairly quickly. Most products on the Retirement List are available only while supplies last. There are a number of products that are discounted too. If you see something you want, do not wait to purchase it. Some of these items will sell out quickly. Stamp sets will continue to be produced until the third week in May. After that date, they will be while supplies last as well. If you click on the Order Online button on the upper right-hand corner, it will take you to my online store so you can place your order immediately.